Apple’s iPhone X is the hottest new smartphone on the planet right now. It’s fast, it’s modern, and it’s an impressive feat of engineering both inside and out. The all-screen design might be the first thing people think of when they think about the iPhone X, but the phone is hiding some even cooler features inside. A perfect example is the battery, which is actually two different batteries that fill as much space as possible to maximize battery life. That said, can you ever really have enough battery life? The iPhone X will take you almost through an entire day without needing to charge, but what if we told you there’s a way to turn that one-day battery life into almost three-day battery life depending on your usage? 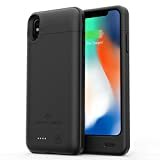 Check out the ZeroLemon iPhone X Battery Case, which is on sale right now on Amazon for just $40. Extend 100%+ Power to iPhone X – The powerful 4000mAh Li-polymer extended battery can effectively provide 100%+ extra battery life to iPhone X, which is equivalent to add 12 + hours talk time or 7+ hour’s movie time. Ultra Slim Protection – ZeroLemon Slim Juicer protects your iPhone X from scratches and other daily wears and tear, yet small and convenient enough to fit easily in your hand or in your pocket. Please note wireless charging is NOT supported by this battery case. Apple Certified Connector: Built Apple Certified Connector works with all functions with your iPhone x charging case. 100% compatible with iOS 11, Apple Pay, and future iOS software updates. Know Before You Go – 4 LED Lights indicates battery levels and charging status. Integrated button allows you to choose when to charge for when you need it most. Zero Defect Guarantee – 365 days ZeroLemon Guarantee Warranty with Amazon 30 days Full Refund Guarantee; Lifetime Customer Support from ZeroLemon. 100% Zero Defect Guarantee.